News TV Channel / DY365 is a 24-hour satellite channel of Assam, India. 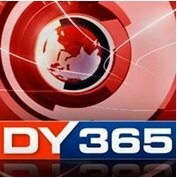 DY365 broadcasts news in Assamese, Hindi, Bengali and English language. It was launched on October 30, 2008. DY365 is a unit of Brahmaputra Tele Productions Pvt. Ltd. Manoj Kumar Goswami is the editor-in-chief of the channel.